We introduce KORLOY that keeps challenging the world. KORLOY shares its happiness with people in the world. The history of KORLOY represents that of the Korean carbide cutting tool industry. You can see the ways to get to us. We introduce our advanced new products. Quality products are our promise to our customers. You can watch product videos. The guide to KORLOY’s carbide cutting tools. Tremendous growth of KORLOY products. We inform you of our latest technology. You can download KORLOY posters. We inform you of our latest news and activities. We inform you of our exhibition. We depict our CI and characters. KORLOY’s milestones in the carbide cutting tool industry. what you’ve wanted for an innovative tooling solution. In recent years, the weight and efficiency of key components in the aerospace, power generation and energy industries have been improved, and the use of heat-resistant alloys, with light weight and high strength properties, has greatly increased. Among the heat-resistant alloys, inconel and titanium alloys have characteristics of high temp high strength and low heat conductivity, which causes problems such as thermal shock, work hardening and vibrations due to high concentration of cutting heat during machining; and shorter tool life and lower productivity due to chipping and breakage. To meet these challenges, KORLOY has developed the MSD Plus-S, specialized for inconel and titanium machining, designed to greatly improve machinability and tool life. The MSD Plus-S prevents chipping and sudden breakage with notch-controlled cutting edges and special edge preparation. Wide chip pockets and the optimized tip flank design significantly improve chip- and heat evacuation. This boosts productivity with stable machining even in high temp cutting conditions. 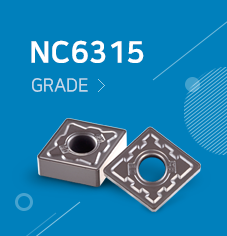 The new grade PC325T features stable tool life with excellent heat resistance and oxidation resistance, its exceptional surface finish minimizes built-up edges while smooth chip flow reduces the cutting load at high temperature. We assure our customers that the MSD Plus-S is the next-generation solution for hole making of components made of inconel & titanium in the aerospace, power generation and energy industries. © 2018 KORLOY All RIGHTS RESERVED. 이를 위반 시 정보통신망법에 의해 형사처벌 됨을 유념하시기 바랍니다.